Hawgleg Publishing -- Home of GUTSHOT! 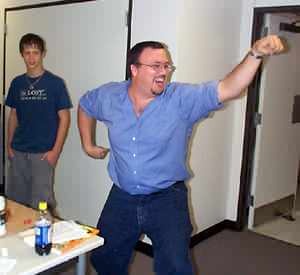 Adrian Gonzalez gets caught up in the excitement as his character, "Crusty Estivan" scores another hit at the NuGamers game club in Kingwood this weekend. Kingwood, Texas – Shouts of excitement mingled with the rattle of dice this weekend as the Gutshot Posse met with a gang of young guns at NuGamers game club this weekend. Adrian was one of six gamers who braved the unseasonably warm Texas heat to join in the monthly gathering at the Kingwood Library just north of Houston. 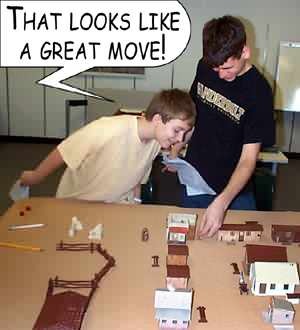 The young men present were old hands at the game table, but new to Gutshot and skirmish-level games. Both Gutshot co-creators Mike Mitchell and Mike Murphy were gratified to hear this. The good-natured ruckus -- and the small Western town on a highly visible table -- drew several curious onlookers from the library. NuGamers founder Justo Perez was happy to hear that. Julian Gonzalez gives hearty approval of Matt Lennon moves his miniature up to the steps of the adobe building in Crowville Flats. Once again, Mitchell and Murphy ran the popular “Last Man Standing” adventure which serves as a fast introduction to the combat system. Murphy himself actually joined in the action, using it as an opportunity to get warmed up for the upcoming games he will be running at Bayou Wars in early June. Along with Murphy, there were four other players in the first game (and numerous onlookers). Mitchell served as GM. The NuGamers young guns line up as the spoils are awarded to the victor: Mike Murphy gives two packages of Artizan Old West miniatures to Adrian Gonzalez, the “Last Man Standing” in our Saturday afternoon game at NuGamers game club in Kingwood, Texas. 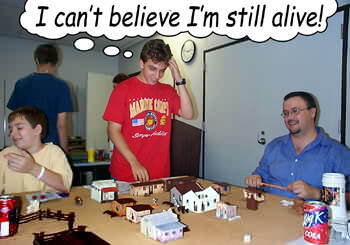 After the first game, the Posse ran a second scenario based on a suggestion by Matt Lennon. 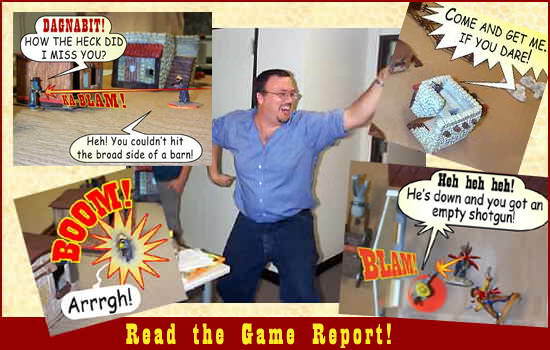 The second adventure was based on the classic game, “King of the Hill.” In this scenario, a two-story building was placed in the center of town and, whoever controlled it at the end of five turns, won the game. If there were two people there, they would settle it with an old-fashioned showdown. Photos and game summaries are available on the Game Reports page. All in all, both Mitchell and Murphy said they had a great time and will definitely return, hopefully as soon as August. Check the NuGamers and Hawgleg Websites for future dates and details. “We had a great time, and I’m really looking forward to coming back, hopefully in August,” Mitchell said. 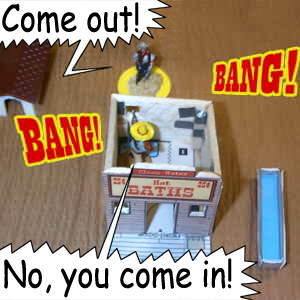 For information about brining the Gutshot Posse to your game club or group, please contact Mike Mitchell or Mike Murphy. We love to travel and will be happy to help you get Gutshot. "This here town is full of Desperados and Gunslingers who ignore the Code of the West… it's time somebody wound up in Boot Hill. Everybody is gunning for everybody else (heck, even the school marm is packing!). Well, hombre, enough is enough! This town is only big enough for you, so if it moves, shoot it! When the gun smoke clears, you wanna be The Last Man Standing!" 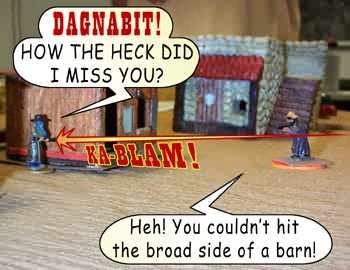 A simple free-for-all adventure that is perfect for introducing new players to the Gutshot game system and Wild West action! 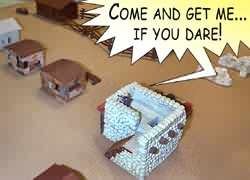 The townsfolk have all fled town, so it's just you against everyone else! 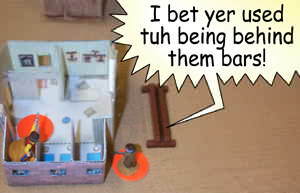 The players rolled dice to determine the order in which they placed their miniatures in town: low numbers went first. 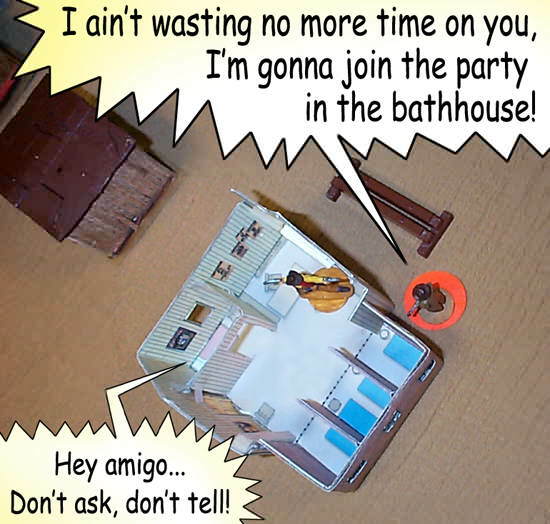 Players could put their figures anywhere they wanted, as long as it was outside a building (this includes placing figures on roofs or right outside a door so they could enter it on their first action.). 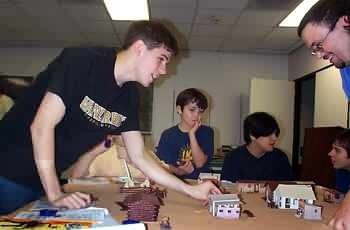 The buildings are a combination of painted S-Scale train buildings and Whitewash City buildings. 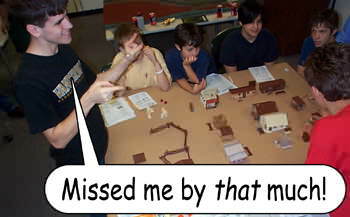 Ishbu (Julian Gonzalez) taunts the other players, daring them to brave the high ground to get him. 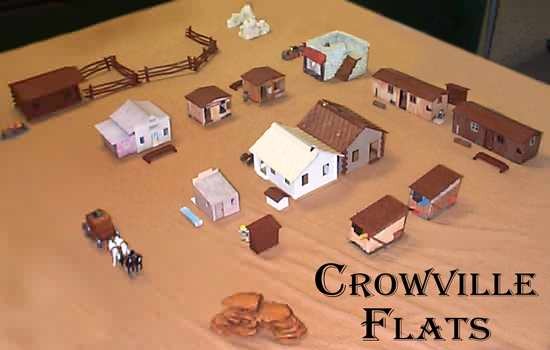 The Texas sun beat down mercilessly as the outlaws scurried through the dusty streets of Crowville Flats. Off in the distance, muted and fading, they could hear the rapid hoof beats of the last townsfolk as they fled. They knew the outlaws were about to have it out, once and for all, and only a fool would hang back and risk being hit in the crossfire. Atop the adobe building that housed the doctor’s office (which, ironically, had a longhorn skull on the front door), Ishbu (played by Julian Gonzalez) taunted his fellow outlaws, daring them to come for him. Around town, the other outlaws spent much of the first Turn repositioning themselves to answer his challenge. Inside the log trading post, near the bath house, behind the outhouses, the other outlaws lurked and waited until someone had the nerve, and the clear shot, to try for first blood. A daring move, but one that failed. Ishbu spun and attempted a Retaliation Shot, but this also missed its mark. Meanwhile, Crusty Estevan skedaddled over to the Bathhouse and hunkered down, waiting for his enemies to come to him. ZZ Fandango (Mike Murphy) takes a shot at Ishbu, and misses. At this point the action centered around ZZ Fandango, who was splitting his attention between the variuos shootouts. Ichi Shinigami (Matt Lennon) holed up in the Sheriff’s Office and traded a few shots with ZZ Fandango through the windows of the jail cells that, perhaps, he would live long enough to occupy once the smoke of this bloody day finally cleared. AN OUTLAW BEHIND BARS... SORTA! Around this same time, feeling left out of the action way over on the top of the adobe building, Ishibu (Julian Gonzalez) decided to join the fun. He quickly ran down the stairs into the street to take a shot a shot at ZZ Fandango (Mike Murphy). Unfortunately, he didn’t make it all the way there before ZZ saw him and actually managed to fire first. The shot missed, and so did Ishibu’s retaliation shot. 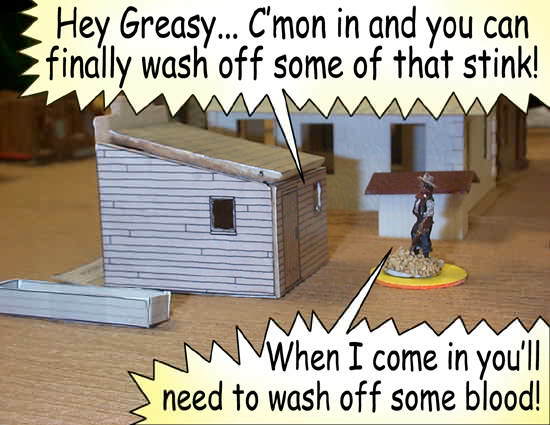 The same luck was being repeated over at the bathhouse: Uncle Crusty took a long range shot at ZZ (who promptly fired back), but again no lead hit its target. The Turn was winding down and Ishibu advanced on ZZ, desperately trying to score a hit with his rifle. He ran up fired – a miss for both parties! From the jail cell, Ichi (Matt Lennon) also took a shot at ZZ – again they both missed. Tired of having his movement drag down his accuracy, Ishibu stood still and fired again at ZZ Fandango. Then it happened. The room was still for a brief moment as all eyes stared at the dice lying on the table. Then pandemonium broke out and everyone started whooping and hollering. The players at the other tables even stopped to stare, wondering what all the commotion was about. ZZ Fandango and Ishbu continue to trade shots without hitting each other. The red disk under ZZ indicates that he's running, which makes it harder for him to shoot, and to be shot! LUCK AIN'T A LADY TONIGHT! 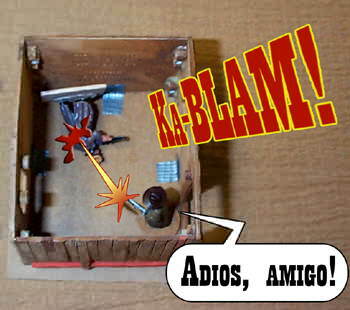 Julian Gonzalez rolls the first Snake-eyes of the game and his rifle explodes in his hands, dishing out 5 points of Damage. Lady Luck turned fickle and what should have been a decisive shot backfired in his face. Julian quickly rolled on the Snake-eyes table and it went from bad to worse: the gun blew up in his hands, delivering damage at Point Blank Range! Damage was rolled and the result was 6 points of Damage. Fortunately, as an Outlaw he had the Tough-as-Nails Specialty which subtracted 1 point from the Damage, leaving him with only 5. This was just enough to fill up his Light Wounds category. Murph, the intended target, celebrated with both style and grace! Although this had no negative effects on his performance, he was definitely spooked when he realized that one more shot would put him at Moderate Damage and start affecting his movement and shooting abilities. Unfortunately, he didn’t get just one more point of Damage. ZZ’s name was the next to be pulled from the hat, and it was a hit! ZZ scored another 6 points on him. Once again the Tough-as-Nails Specialty saved him a little, but he now ended the Turn with 10 points of total Damage. Even as he watched Uncle Greasy run over to the bathhouse, Ishibu knew he wouldn’t last long at this rate. Murph does his Funky Egpytian Victory Dance when the shot aimed for him backfires in Julian's face. Ohhh, Snake-eyes can be so very cruel (but not as cruel as this dance!). The battle lines had been drawn and the action stepped into high gear during this Turn. It also started with Ishbu in dire straits. He was badly wounded right in front of ZZ Fandango, and he was unarmed! His weapon had blown up and he hadn’t yet been able to switch to his shotgun. All eyes were on the GM as Mitchell reached into the hat to pull out the first name of the second Turn. The entire game could hinge on what happened next… and it was Ishbu! Julian let out a whoop of relief and quickly pulled out his shotgun and fell into the nearest house where he hit the dirt, waiting to blow away whoever was brave enough to chase him. Crust Estevan was holed up inside, just daring Uncle Greasy to come and get him. The yellow disk indicates that he was trotting. The action then shifted back to the bathhouse. Crusty Estevan was still barricaded inside and Uncle Greasy moved up on him, shotgun in hand. The taunts were loud and rude on both sides of the wall, yet Greasy hadn’t lived that long by rushing in like some headstrong young pup. Nope. He didn’t react until Crusty actually fired off a shot at him. He retaliated with a single blast of his shotgun. Unfortunately for Greasy, the wall of the bathhouse proved to be more than ample cover and his shot didn’t connect. Crusty then decided that it was time to play smarter, so he went to a crawl and braced himself for Uncle Greasy’s impending assault… and he didn’t have long to wait. Uncle Greasy’s name was the next pulled from the hat and, cool as a cucumber, he walked into the bathhouse and emptied his remaining barrel into Crusty at close range. It connected, and so did Crusty’s retaliation shot. 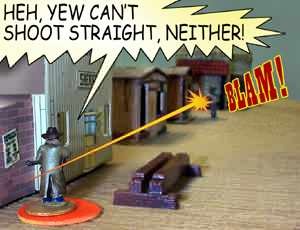 But, as is well known in the Wild West, shotguns are just plain ugly at close range: he dished out twice as much Damage as Crusty, doing 6 and 3, respectively. The action got hotter than the water as Crusty and Greasy started to shoot it out. Matt Lennon, playing Ichi Shinigami opened fire on ZZ Fandango (played by Mike Murphy), which drew the old coot away from where the kid was holed up (apparently there were a lot of Samurai Cowboys running around this part of the West). Meanwhile, back at the Sheriff’s Office, Ichi fired on ZZ Fandango. Both his, and ZZ’s retaliation shot, missed. This did manage to draw ZZ off, however, and Ishbu used this opportunity to pull his bloody hide into a corner and start aiming. Ishbu was in a small shack with one door and two windows. Crouched on the floor, he started to Aim at the entrances. He could cover any two of them, so he told the GM privately which ones he was covering. That way, when someone finally came for him – and he knew they would – he would have a better chance at taking them down, even if he went down himself. Ishbu, with 10 Damage, decides that discretion is the better part of valor.Ishbu decided to take advantage of the Aiming rules: for each Action that he spent aiming he got a +2 bonus against whoever entered the door or one of the windows. Unfortunately, he could only cover two of the three entrances. It was up to his enemies to guess which one was not being covered. THE FUNNIEST LINE OF THE NIGHT! ZZ Fandango (Murphy) may have revealed a bit more than he intended when he decided not to enter the Sheriff's Office where Ichi (Matt) was holed up. The building is a highly modified version of the Whitewash City Sheriff's Office. Mitchell built a custom cardboard box to glue the paper to, and also printed out a second version to paste on the inside. Wooden dowels serve as extra support for the roof and structure. Matt Lennon (Ichi Shinobi) observes that a miss is as good as a mile. Mitchell and Matt both groaned at that one, but the others were too far gone in the fog of battle to notice it. ZZ then burst into the batthouse and Murph rolled a dice to see who he was going to target. Greasy was the man in the sites, but ZZ missed him, rolling one point shy of his Target Number. Greasy decided to save his ammo for Crusty, so he didn’t make a retaliation shot. A few more shots were exchanged between ZZ, Crusty, and Greasy, but no one managed to connect. 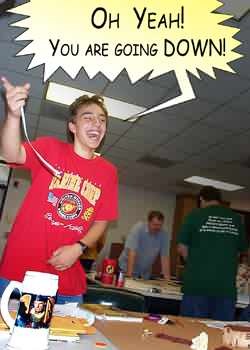 Honestly, it was some of the WORST dice rolling the GM has ever seen! Turn three opened quickly as Crusty Estevan ran like a girl to avoid Uncle Greasy. It also gave him a chance to reload. ZZ Fandango fell back to the roof of the adobe building and started aiming at an area near the shack where Ishbu was holed up. His plan was to take out anyone who went after the wounded outlaw. Most likely, ZZ wanted him for himself! Shaking in their boots, that is! Turn Three was spent with a lot of moving and only a little shooting. TO the right, and out of camera range, Ishbu was still holed up in his shack and ZZ Fandango had taken up the "Lee Harvey Oswald" position on top of the adobe building. 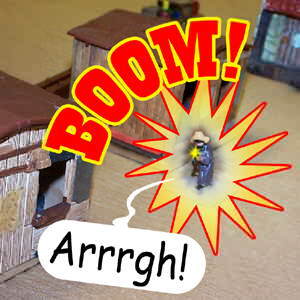 Ishbu continued to aim and, by crouching, had a +6 to hit whoever dared to come into his shack. At this point, his best hope was that the others would finish each other off and leave him the sole survivor. The end was neigh as the action moved into the large double building in the center of town, and the Turn opened with a bang! 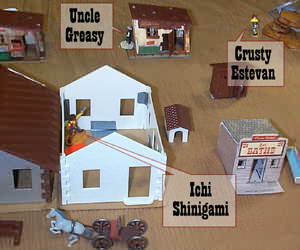 Ichi and Uncle Greasy were both crawling commando style on their bellies taking pot shots at each other when, finally, Uncle Greasy got up and attempted to crash through the window at Ichi… and he failed! 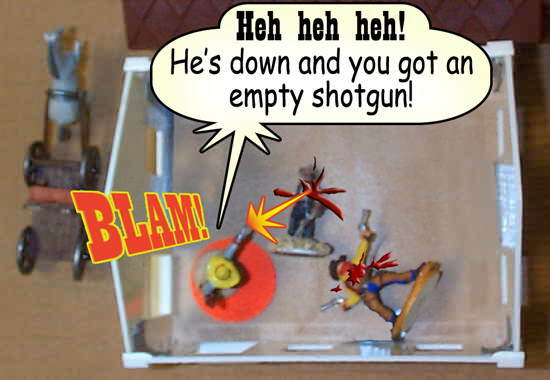 In short order Ichi fired at Greasy and delivered 3 points of Damage, and then Lady Luck smiled on the poor old Uncle… he opened fire with both barrels of his shotgun, hit and scored exactly enough Damage to drop him! Uncle Greasy (middle) had just killed Ichi (a bloody mess in the yellow shirt) when Crusty Estevan burst in and killed Uncle Greasy. But would luck continue to smile on him? Crusty Estevan was making a mad dash for the building. ZZ Fandango shot him for 2 points of Damage, but he ignored it (and he was out of range) and made it into the bloody building and got the drop on Uncle Greasy, who had just reloaded. He shot Uncle G. for 2 points of Damage and, unbelievably, Uncle’s shotgun blast missed its mark and Crusty was uninjured, facing an opponent with an empty weapon. It was now coming down to the wire: initiative meant everything, and Uncle Greasy won the draw. He considered running, but realized that wounded and getting up from a crawl, he couldn’t make it out of the building in one Action. So he gritted his teeth with determination and, once more, reloaded his trusty shotgun. Once more it was Crusty’s turn, and this time he connected, finishing off Uncle Greasy with 2 final points of Damage. The Uncle was down, and his final retaliation shot missed. Two down, three to go, and there can be only one! Adrian Gonzalez ponders life, the universe, and everything... and the luck of his dice rolls. Ishbu stayed in his shack, holed up with a +6 to hit if the person came through the wrong window. ZZ Fandango got there first and chose the wrong window… he walked right into Ishbu’s rifle blast and fired at him and missed. Ishbu planning had paid off – he scored a solid hit and dished out 6 points on ZZ. Good, but not enough to kill him. Ishbu reloaded his shotgun, but it was too late. ZZ drew next and Murphy let out another whoop of victory (but spared us his dance, this time): BOXCARS! The 11 points of Damage was more than enough to drop him: Ishbu was down. To add insult to injury, Ishbu’s final, parting retaliation shot missed. Since Murph wasn’t eligible for the final victory prize, and the hour was getting late, we called the game and Crusty Estevan (played by Adrian Gonzlez) was declared The Last Man Standing! 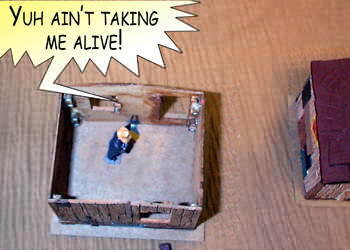 Murph rolls Boxcars (a natural 12) and finishes off Ishbu, who had been holed out in a shack waiting for them to come to him. The game was over, but not the decisions. We brought a nice selection of prizes and Adrian was torn between two packs of Artizan Old West miniatures and a classy Gutshot Stein. His younger brother, Julian, was very insistent he choose the stein, but big brothers seldom listen to younger ones… he went with the minis! Later, he even talked Mitchell into swapping an unpainted Artizan fig for the painted Crusty Estevan mini he had used in the game.